Maybe there is more to this story, but on the face of it, I'd warn my gardening friends to put LARGE labels on their Japanese maple seedlings. Food and fabric sums up this week's trip to Shipshewanna with my mother-in-law. She's still doing good but tired quickly. This may be our last trip together. Our first stop was E & S Foods. It's fun to try new things, but I don't recommend honey coated flax corn chips. There was no mistake with their cheeses and flours. I'm ready to bake some unusual breads now. The second stop was Yoder's for fabric, which was my reason for the trip. 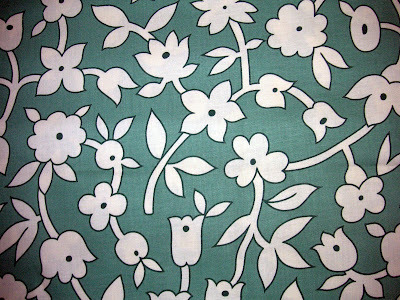 I asked for retro apron fabrics and they had such a fun selection it was difficult to choose. But I fell in love with this fabric. These colors aren't true; the middle picture is the closest. Then I tried dozens of contrasting material. The smaller designs that coordinated with the main fabric were too busy and the larger designs that worked well with the print weren't the right color. So I selected a plain color and then some polka dots for trim. My intent was to trim in rick-rack, but that didn't work without a secondary color to pick up. 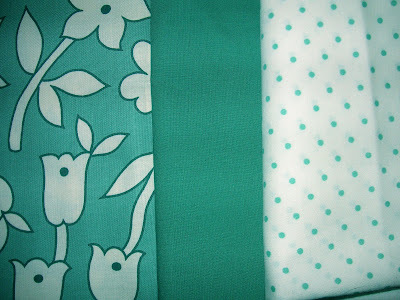 So the plan is to use my grandmother's handmade pattern and make a reversible apron with a plain green pocket on the print side and a print pocket on the green side and use the polka-dots to trim the pockets and perhaps the yoke. Or maybe I'll make a polka dot pocket on the plan side. 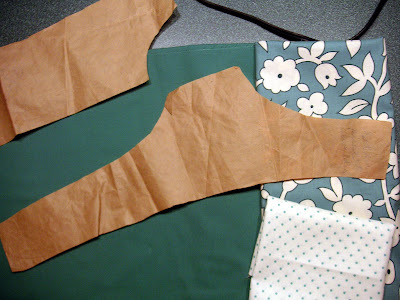 I haven't sewn for almost 40 years and there are few instructions with Grandmom Diehl's pattern--just the word "apron" on the large piece and "Set in shoulder seam" on one end of the small piece shown below. I decided to mock up the apron using an old sheet before I cut into my fabric. No way could I figure it out. So yesterday I bought an apron pattern (and sewing shears and pins and thread. Also some fleece and a pattern to make a hat for my mother-in-law as chemo claims her hair.) This morning I looked at the handmade pattern and finally figured it out. The small piece is cut on the fold where it protrudes. The long end is set into the shoulder and the short end is attached to the apron body as it wraps around the waist into the back. The problem is that it didn't wrap around to the back of me. So now I have to decide whether to modify the pattern or use the pattern I bought. Stay tuned as I continue to get in touch with my latent sewing skills. I'm messing with my template as you may have noticed. I decided to add my own picture as the header (moss from last spring) and then wanted to pick up the colors from the photo in the template. However, I cannot change all the colors, only some. Gah, it looks bad and I can't revert. So come back later and see what it looks like. Update one hour later: Now it's a spider from last fall and red is now brown. Who knows what I'll end up with. But my house isn't getting any cleaner as I mess with this. Cedar Creek at Cedarville, IN is now at 4790, but it looks like it may be cresting. I hope so. We pulled the riverboat onto shore of the St. Joe River, which shows no sign of cresting yet. The boat is now floating. If the water drops before it freezes, we will be OK. If the water freezes at the flood stage, the expansion will crush the pontoon tubes. Too bad we didn't move it to the barn. With 60° temps and heavy rain, my crocus thought it was springtime. The foliage is just breaking through. 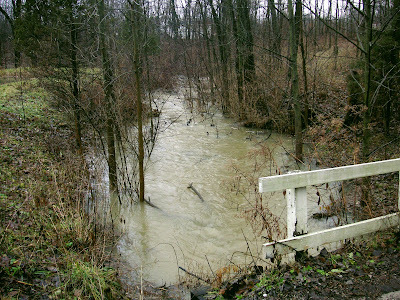 Usually Not Creek, which runs through our land before feeding into Cedar Creek, is over its banks and gurgling over tree roots. The USGS Real-Time Water Data site shows Cedar Creek at 2720 cubic feet per second with the record at 2830 for this date. To give you an idea of how high this is, the 80th percentile is 401 cubic feet per second. Here's the link to the site but since it is in real time, I'm not sure you can tell much from it. But follow the link anyway and explore your favorite rivers. UPDATE: I posted this and then viewed it and checked the link. 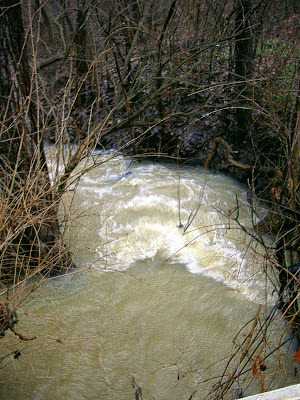 Cedar Creek has set a new 60-year record flowing at 2880 cubic feet per second. Update 2: It is now up to 3900 cubic feet per second and it is still raining. 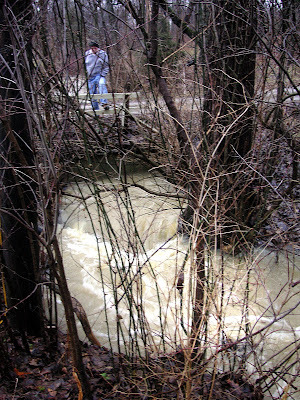 As you look at these pictures of Usually Not Creek, remember that this is almost always a dry creek bed, it is the middle of winter, and none of this water has reached the already high Cedar Creek. What I've been doing: Cross my heart. Hope to die. Stick my finger in my eye. What I solemnly swore as a child: Cross my heart and hope to die. Stick a needle in my eye. Most likely the origin: Cross my heart and may I die, if I so much as tell a lie. In fact, I have been sticking my middle finger in my eye ten times each day since Thursday. I'm getting contacts this morning and training the reflexes in my eyes. I use reading glasses, but my eye exam showed a very significant change in distance vision also. So I tried on about ten thousand pairs of glasses, before deciding on a pair that definitely made a statement. Then we talked about bifocals with or without a line. Then I realized I needed some type of sunglasses. It was getting more and more expensive, so I finally said, "What about contacts?" This afternoon I should be able to see the birds in the trees and bushes around our feeder!